every three children younger than 3.
every five children 3 and older. No food, drinks (except water bottles), or gum in the Museum Galleries. Treat visitors and exhibits with respect. What is an appropriate age range for the Museum? The Virginia Discovery Museum is recommended for families with newborns to age 8, but many older children enjoy our exhibits and programs, as well. If you’re unsure if your child will enjoy VDM, we encourage you to check out our Exhibits page or stop by Charlottesville’s Downton Mall to visit us and take a quick walkthrough to decide if the Museum is a good fit for your family. How long should we plan to be at the Museum? It takes about an hour to see everything in the Museum, but our educational play spaces are designed to accommodate your schedule, whether that’s just a quick 20- or 30-minute pit stop or a family day out on the Downtown Mall. Want to grab a bite to eat? Kids need a nap? Admission is valid until we close at 5:00 p.m., so feel free to take a break from your visit and come back to see us later in the day – just be sure to hold on to your receipt to re-enter. Is _______________ exhibit still at the Museum? Museum exhibits often change, but certain, time-honored exhibits like Amazing Airways and the Showalter Cabin are still here. We’d love to hear which exhibits, past and present, are your favorites and invite you to leave a comment on our Question & Comment Board in the Front Lobby, send us a message Facebook, or email us at marketing@vadm.org! Can my family leave and re-enter? Yes. Admission is valid for the entire day, so you may come and go as many times as you wish until we close at 5:00 p.m. Be sure to hold on to your admission receipt in order to re-enter. Does the Museum have any free days? The first Wednesday of every month is Wegmans Wednesday. Sponsored by Wegmans Charlottesville, this monthly Pay What You Wish admission program waives the Museum’s normal entrance fee for all visitors. In lieu of paying admission on Wegmans Wednesdays, visitors are invited to make a donation to help support our nonprofit Museum’s exhibits and programming if they would like. VDM also offers a special late-play program called $5 After Five from 5:00 to 8:00 p.m. on Friday evenings during the summer. Admission is just $5 per family for members and non-members alike. Be sure to check our Plan Your Visit page for more information about admission discounts and special admission programs. Are food and drinks permitted in the Museum? VDM does not allow gum, food, or drinks (other than water bottles) in the Museum Galleries in order to accommodate visitors with allergies. If you wish to have a snack, we invite you to sit in the Front Lobby or, if the weather is nice, outside on the benches by the carousel or the tables at the Pavilion. Are there places nearby to eat lunch? 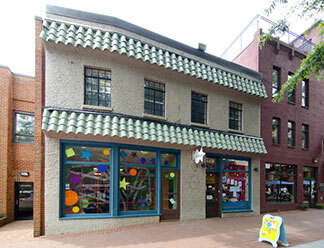 Charlottesville’s Downtown Mall has lots of family-friendly places within walking distance to grab a bite to eat. Three doors down from the Museum is Baggby’s, which features gourmet sandwiches and subs, soups, and salads. Some other places to check out include Draft Taproom, a casual restaurant that features a “Half Pints” kids menu; The Nook for diner-style dishes and all-day breakfast; Vita Nova and Christian’s Pizza for pizza by the slice; Marco & Luca for dumplings and noodles; and Revolutionary Soup, whose menu includes many vegetarian and vegan options. Craving something particular? Be sure to ask the volunteer or staff member at the Front Desk for recommendations. Keep in mind that the Museum is located on a pedestrian mall. Street parking is available around the Downtown Mall, but we suggest parking in the Market Street Garage, which is conveniently located across from the Museum and provides visitors with their first hour of parking for free. From the garage, take the Main Street elevator to the ground level; VDM is across the bricks to the left, next to our antique carousel. The Museum is also located next to the Downtown Transit Station and Visitors Center, and Charlottesville Area Transit offers a Free Trolley that stops at the station as it travels through Downtown and the University of Virginia. Learn more about CAT’s routes and fares at charlottesville.org. Does the Museum validate parking? Yes. As of Oct. 1, 2017, VDM validates parking for Museum visitors at the Market Street Garage only. Receive an additional hour of free parking, for a total of two free hours, when you ask for a validation ticket at the Museum’s Front Desk. Does the Museum offer guest Wi-Fi? VDM is pleased to offer high-speed wireless Internet access to our visitors thanks to Ting Charlottesville. Please inquire at the Front Desk or ask a staff member during your visit for information on how to connect to the Ting_2.4G@VDM guest network. Yes. You may either take your stroller with you during your time in the Museum or park it in our convenient Stroller Room located by the Front Lobby. The Museum does not have lockers; however, our Stroller Room, located by the Front Lobby, is equipped with spacious cubbies. You may store your belongings in these cubbies during your visit, but the Museum is not responsible for any valuables. Does the Museum have changing tables? Yes. Both the men’s and women’s restrooms, located at the rear of the Front Gallery next to the Light Bright, are equipped with changing tables. Does the Museum provide diapers or baby wipes? VDM occasionally receives donations of diapers, training pants, and baby wipes that we keep on hand in case of accidents, but we cannot guarantee that these items will always be available. If you’ve forgotten your diaper bag or your child has had an accident, please stop by the Front Desk or speak with a staff member so that we can assist you. Is the Museum open during snow? We are often open when schools are closed on snow days, provided the roads are still passable and safe. Before heading out, call us at (434) 977-1025 or check our homepage, our Facebook page, or with your local news stations NBC29 and Newsplex to see if the Museum is open. VDM is always looking for enthusiastic volunteers to help us in the Museum Galleries and at the Front Desk, during programs at the Museum, and at special community events. Check out our Volunteer page to find out how you can use your time and talents to help enrich the lives of children in our community through hands-on play and experiential learning and to fill out a Volunteer Application. Can’t find the answer you’re looking for? Give us a call at (434) 977-1025, or send us an email at vadm@vadm.org. Don’t forget: We are often open when schools are closed on snow days! Before heading out, call us at (434) 977-1025 or check our homepage, our Facebook page, or with your local news stations NBC29 and Newsplex.